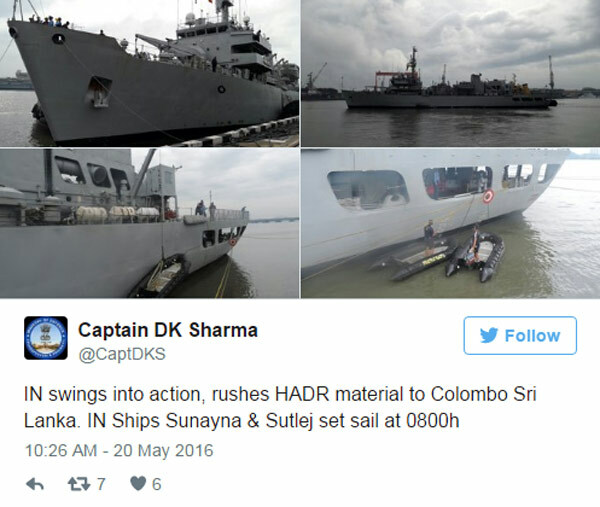 India on Friday rushed two naval ships with relief materials to cyclone-hit Sri Lanka, the Indian Express reported. INS Sunayna, an NOPV (Naval offshore patrol vessel) and INS Sutlej, a survey vessel with relief material have been rushed to Colombo from Southern Naval Command Kochi. The first tropical cyclone, ROANU, of the season in the Bay of Bengal has caused devastation for thousands in Sri Lanka. Prime Minister Narendra Modi had condoled the deaths on Thursday. For sure a big 'Thank you' to India. But is this the way you expect Indians to help us forever??? Kind of refugy status??? Where GMOA now? Have they not set up a free clinic to help the people. Where is the president of the clan now? When anything is given free, the yakkos will be quiet and happy. These are all tactics. They want to arrive before China arrives. Hope they will NOT push for CEPA agreement in return. so how many people have you and your family fed..
Why do not you and patriots protest in front of the Indian Embassy to take the ships back? Do not you know this is a trick to get some hidden benefit from sri lanka. Can you guess what is Indian aim? It's a real shame to see some the anti Indian sentiments published over here at time like this when people are in trouble and seeking assistance no matter from whom. This is the problem we have in this country where majority of the population are uneducated and walking time bombs. Be more sensible and comment with more responsibility.These are called the Yakkos. It shows none of your relatives are affected. Aiyo..........Ane Appida Indian Parripu Eppa !